Kris Aquino says bashers have no say on how she wants to spend her hard-earned money. Kris Aquino remarked that the opinion of her bashers will never affect her decision to be giving to others. The actress-host stressed that since it is her hard-earned money, she can do whatever she wants with it. 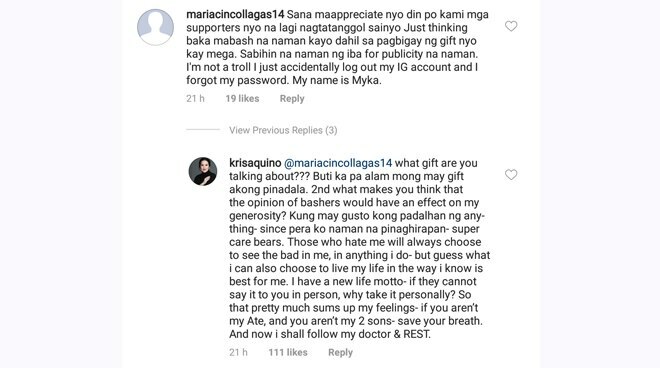 One netizen told Kris on Instagram, "Just thinking baka ma-bash na naman kayo dahil sa pagbigay ng gift nyo kay Mega. Sabihin na naman ng iba for publicity na naman." In response to the comment, Kris wrote, "What gift are you talking about? Buti ka pa alam mong may gift akong pinadala. 2nd what makes you think that the opinion of bashers woud have an effect on my generosity? Kung may gusto kong padalhan ng anything - since pera ko naman na pinaghirap an - super care bears." She added that bashers would have always something negative to say about her no matter what. "Those who hate me will always choose to see the bad in me, in anything I do - but guess what I can aso choose to live my life in the way I know is best fro me. I have a new life motto - if they cannot say it to you in person, why take it personally?," she stated.